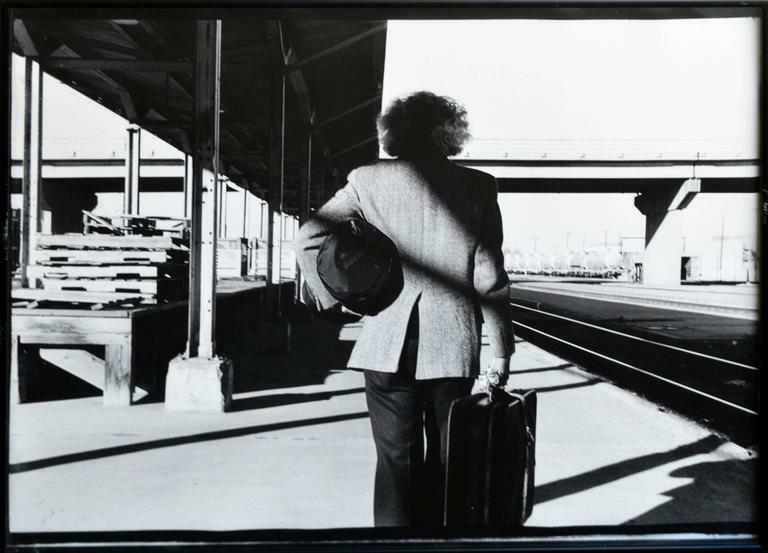 A series of five photographs by Betty Hahn titled, "Arrival or Departure (After Hitchcock), 1987, a series of five gelatin silver photographs" 17" by 24 each". A copy of the book included "Betty Hahn by Steve Yates. Gelatin silver photographic prints on paper mounted on foam board. Each has a sticker "BHC" with the letter indicating the print sequence "A-E". Following excerpt from the book "Betty Hahn "Photography Or Maybe Not" by Steve Yates, from the essay by Dana Asbury: "Instead of crime fiction and forensic photograph, the first filmic sequences have a moody raking light of film noir in the forties, and she titles Arrival or Departure (After Hitchcock) (plate 117). 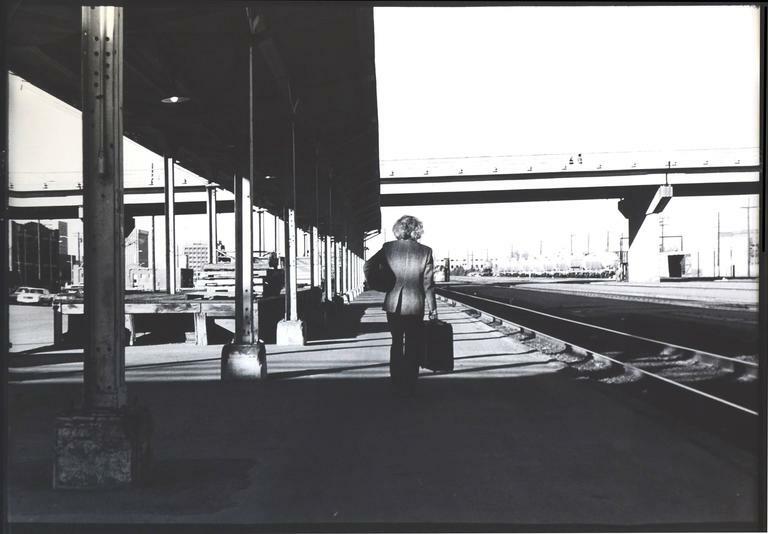 This series of 5 photographs (1987) shows the back of a man, unidentified, at a deserted train station, in late afternoon light. The rest is ambiguous. Is he coming or going? Is he moving away from him? 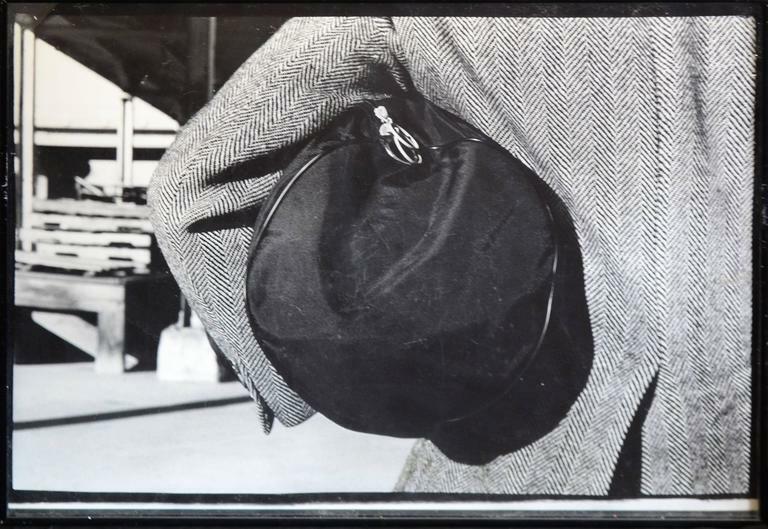 Is there significance to the first close-up shot of a black duffel bag stuffed under his arm? It was of course Hitchcock's particular genius to explore the ominousness of everyday situations, and to show us that looking to long at anything makes it look suspicious. This series pays homage to Hitchcock's use of the tracking shot that conveys his terrifying message behind "Teddy Bear", that there is serious threat in ordinary objects. This series also fits in with the mood of "Appearance, Ehrlichman Surveillance", and many of the crime series-solitary male figure in an urban setting. There is a tough edge to these works." 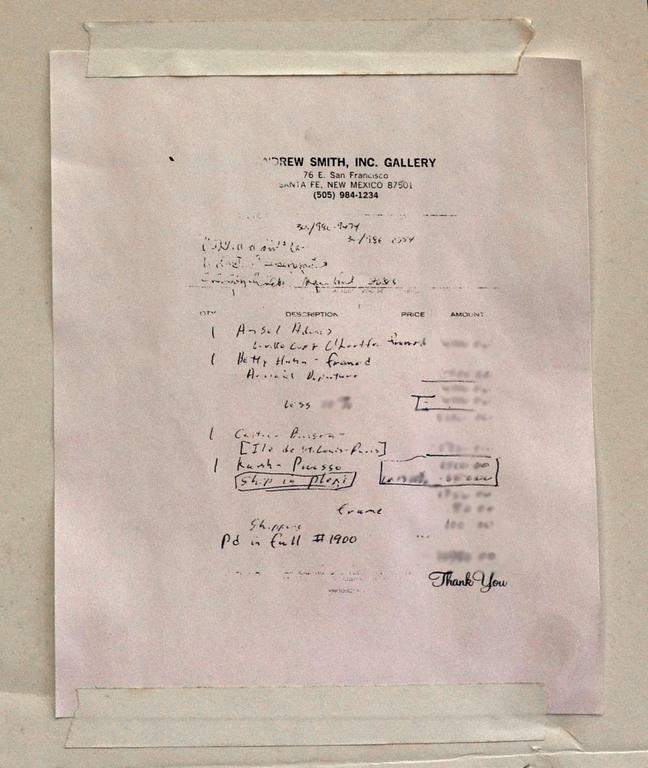 Unsigned, gallery receipt of purchase copy included with notation on verso . 5 framed images. 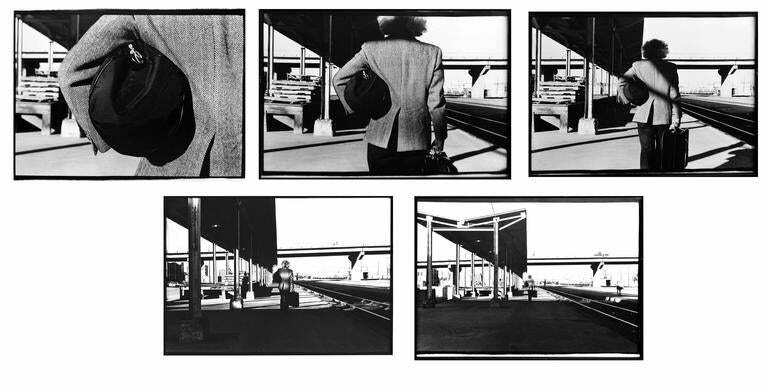 Each image, 16.5"H x 23.5"L. The following biography is by Fumiko Koizumi at: The Visual Studies Workshop in association with the State University of New York at Brockport Betty Hahn was born Elizabeth Jean Okon on October 11, 1940 in Chicago, Illinois. In 1967, Betty Hahn moved to Rochester to pursue a job at Kodak or Xerox. While in Rochester, she participated in Nathan Lyons's Visual Studies Workshop from 1967 to 1968. Lyons lectured on "vernacular" and "snap shot" photography to workshop students, reinforcing Betty's interest in this "folk" tradition. During her time at the VSW she met Tom Barrow, Roger Mertin, and Alice Wells, and reconnected with Robert Fichter. She was encouraged by how their work was challenging the rules of what was common in fine-print photography. At age 10, her aunt Marcella Brown gave Betty her first camera, a Brownie #2. At this same time the Okon family moved to Indianapolis, Indiana. After graduating from Scecina Memorial Catholic High School in Indianapolis, she entered Indiana University in Bloomington, Indiana. She earned a four-year scholarship and studied fine arts. While she was experimenting with photographic image making her initial artistic experiences involved painting and drawing. She did not take photography seriously as a medium for her artistic expression during her undergraduate work. At age 23, Hahn graduated with a Bachelor of Arts degree and continued at Indiana University for graduate studies in the department of photography. At the suggestion of Henry Holmes Smith, she started experimenting with the gum bichromate process. Smith convinced Hahn that photography was serious, potent stuff, and she eventually settled into the comfortable but exciting dialogue with photography which would characterize her career. Working under Smith, she met Robert Fichter, who became the subject of some of her early photographic projects. In 1966, after graduating with a Master of Fine Arts degree from Indiana University, she moved to Ithaca, New York. She was hired at Cornell University to make slides for the Art History Department slide library. After a year at Cornell she moved to Rochester. After spending some time at VSW, she began teaching photography and design to deaf students at the National Technical Institute for the Deaf. After one year she transferred to the School of Photographic Arts and Sciences at Rochester Institute of Technology where she taught until 1975. Hahn met Lee Witkin at a reception at the George Eastman House in Rochester, New York, in 1972. 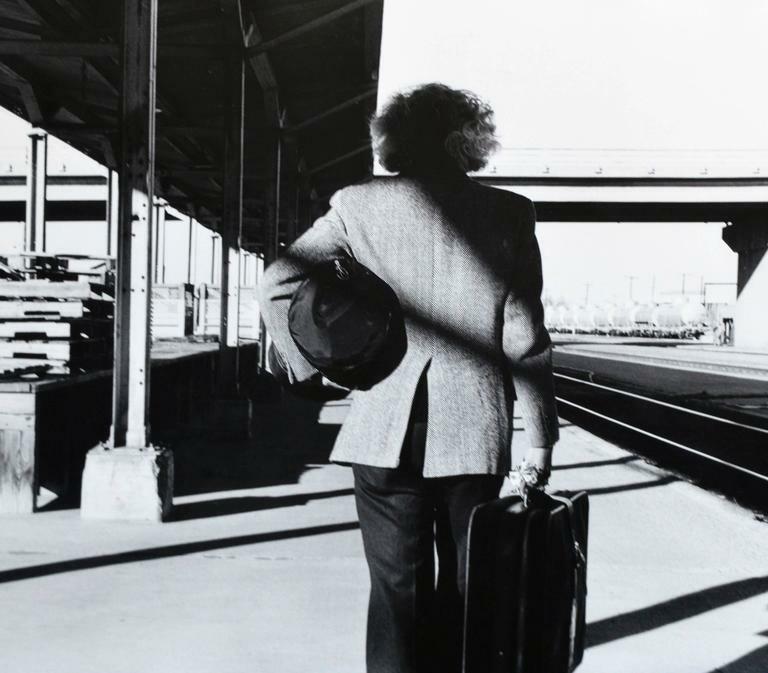 Her first one-person show, "Betty Hahn," opened in New York City at the Witkin Gallery in 1973. In 1974, she received a grant from the National Endowment for the Arts to be a visiting artist at Franconia College, New Hampshire, to continue projects in non-silver processes and mixed media. 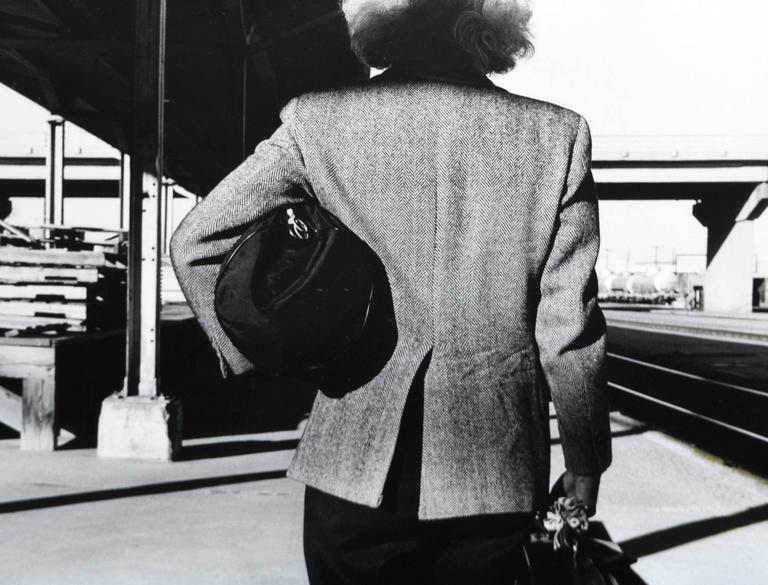 At the age of 36, Hahn was hired as a visiting professor to teach photography at the University of New Mexico in Albuquerque. In 1978 and 1983, she received grants from the National Endowment for the Arts for ongoing projects. 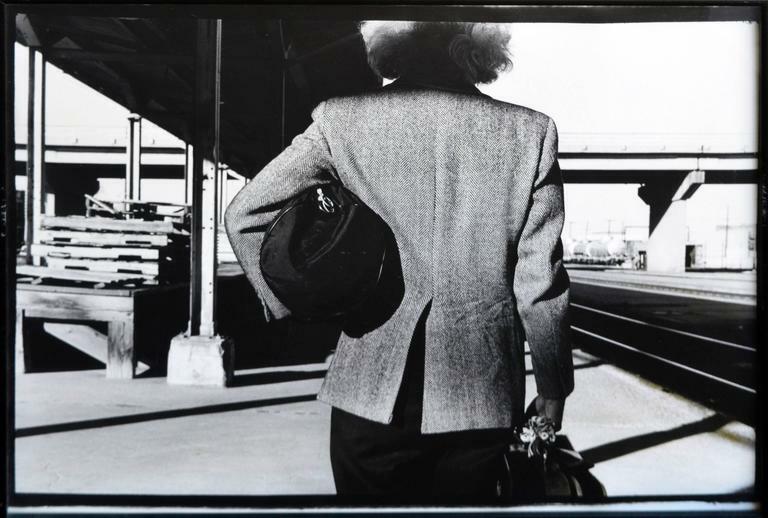 During the spring semester in 1986, she became full professor of photography. She taught there until retirement in 1997. Among the museum collections that contain Hahn's work are the Art Institute of Chicago, the Museum of Modern Art, New York, the National Gallery, Ottawa, and the San Francisco Museum of Modern Art. Unsigned. 5 images. Each image, 17"H x 24"L, black aluminum frames included.